The informal economy of the streets of San Salvador has a little of everything. 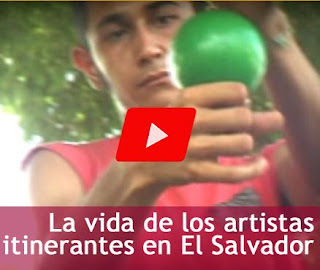 This video from the digital media site ContraPunto highlights the street performers of El Salvador's capital city. Watching this video prompted Linda to write about her encounters with these street corner entertainers in this post. I surveyed this sparkling expanse of blue amid the volcanoes. Just a week ago I’d never even heard of Lago Coatepeque, or Los Volcanes National Park, home to three volcanoes. I relished the swaying of the palms in the electric breeze, waiting for the storm to arrive. Lightning flashed over Santa Ana Volcano on the far side of the lake—the same volcano I would climb the next day. After weeks of backpacker hostels I had decided to splurge and stay at the Torre Molina, what passed for a luxury resort in these parts, and shelled out the $30. Dining options were limited, so I stayed for dinner. I ordered grilled tilapia and was savoring the meal along with the sunset out on the balcony overlooking the lake, when Elmer, a friendly hotel staffer, interrupted my reverie. The organization Transparency International released its annual Corruptions Perception Index today. El Salvador ranks relatively well among its peers, but that hardly means that it has a government with a reputation for honest officials. Starbucks has announced that it will be opening its first coffee shop in Central America in San Salvador. The store is part of a plan to open locations throughout Central America. The locations in Central America will be operated under license agreements with Corporación de Franquicias Americanas (CFA). Starbucks and CFA will open the first coffee shop before year end in the Santa Elena residential zone in San Salvador. CFA operates franchises for several global brands in Central America including Kentucky Fried Chicken, Wendy's, China Wok and Pizza Hut. Three skyscrapers completed in 2009 and 2010 give San Salvador the bulk of the tallest buildings in Central America (excluding Panama). The tallest is the new Pedregal Tower apartment building in the Multiplaza development. The 100 meter tall building features 28 floors of luxury apartments. October 15 is Blog Action Day. Thousands of blogs today are devoted to the single issue of water. Water is a a paradox in El Salvador. At many times there is too much water, and floods destroy crops or heavy rains produce landslides burying homes. And yet hundreds of thousands of Salvadorans lack a source of clean potable water for their daily living. According to Salvadoran government statistics, only 78.7% of homes in the country have access to clean, piped water. While the percentage of homes with potable water is 90% in urban areas, the total is only 56.7% in the rural areas of the country. These statistics put El Salvador behind most other countries in Latin America according the to the Monitoring Program of the World Health Organization and UNICEF. I have been remiss in failing to point out the 50th Anniversary of the Comandos de Salvamento. Wherever there is a natural or man-made disaster in El Salvador, the Comandos de Salvamento, "Rescue Commandos," are sure to be there. With their yellow uniforms with the green cross, these volunteers provide emergency services throughout the country. September 30 marked 50 years since the founding of this fine organization. Comandos de Salvamento is a Salvadoran humanitarian institution whose mission is to save the lives of people due to consequences of mother nature or of man, regardless of race, religion, or political creed. To contruct a systematic professional response of humanitarian aid during emergencies based on prevention, education, mitigation and quality control that generate structural changes in order to augment our work in Communities, Municipal Government, and the National Civilian Protection Agency. “The government that I lead wishes to be the first government that in the name of the Salvadoran state...makes an act of contrition and begs pardon of the indigenous communities for the persecution, for the extermination of which they were victims for so many years,” Funes said on the 518th anniversary of Columbus’ landing in the Americas. “From this day forward we officially terminate our historical denial of the diversity of our peoples and acknowledges El Salvador to be a multiethnic and multicultural society,” he said in inaugurating the First National Indigenous Congress. Today is the 30th anniversary of the founding of the FMLN. The FMLN was founded in 1980 as the military wings of five revolutionary movements in El Salvador came together to form a unified guerrilla force which would fight a civil war in El Salvador for the next 12 years. And in the 18 years since the end of the civil war, the FMLN has been the dominant leftist political party in El Salvador. At the time of this 30th anniversary, the FMLN is at the point of its greatest influence, with a president, Mauricio Funes elected under its banner last year and the largest number of deputies in the Salvadoran National Assembly. Ironically, though, it was probably Funes' decision to keep the party at arm's length during the election, that made him electable. And Funes continues to follow a course as president which is independent of the FMLN party platform. The organization Bpeace has chosen El Salvador as one of the countries where it will work to reduce conflict and violence by creating jobs. (The other countries where it currently works are Rwanda and Afghanistan). The organization supports and provides business acumen to local entrepreneurs to kick start the creation of jobs. You can read about their initiative in El Salvador on the Bpeace website at this link. The digital periodical El Faro had a lengthy article in the past week about the number of deaths in El Salvador caused by alcohol. The article was based on statistics from the World Life Expectancy web site which ranked El Salvador first among 192 nations in the rate of alcohol-related deaths. El Salvador reported a death rate from alcohol of 22.8 per 100,000 inhabitants. (The number 2, 3 and 4 ranked countries were also from Central America). The appearance of the World Life Expectancy website gives some doubts to its credibility, so I turned to the comprehensive 2004 Global Status Report on Alcohol published by the World Health Organization. That report has comprehensive statistics on the consumption and consequences of alcohol in countries throughout the world. The WHO focuses on alcohol and its abuse as a public health problem. It was almost 50 years ago in 1961 that El Salvador broke off diplomatic relations with Cuba after Fidel Castro's successful communist revolution in the country. Through most of those 50 years, a fierce anti-communism among the conservative ruling powers in El Salvador made the two countries cold war enemies. During El Salvador's civil conflict, Cuba provided moral and other support to the FMLN guerrillas fighting the US-supported government. So this week's visit by Mauricio Funes, the country's first elected president from the left wing FMLN, was filled with symbolism. 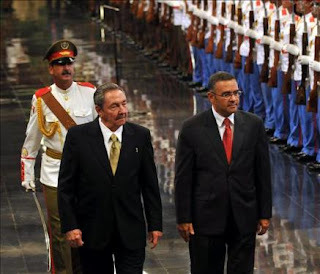 The trip follows Funes' re-establishing El Salvador's diplomatic ties with Cuba in June 2009, a step which Funes took as one of his first official acts after assuming the presidency. Unnerved by the explosion of drug trafficking in the region, Central American governments are petitioning the Obama administration for more funds to strengthen their police and social programs, saying current U.S. aid is insufficient. President Mauricio Funes of El Salvador presented a $900 million Central American anti-drug-trafficking plan to Secretary of State Hillary Rodham Clinton on Wednesday, and asked the Obama administration to help fund it. But with the administration under pressure to cut costs, it may be difficult for the Central Americans to win more U.S. aid. The U.S. government has spent about $1.8 billion over three years to fight drug trafficking in Mexico and Central America through the Merida Initiative.